Just after noon - a table of four senior gents already deep in conversation. Yates' (Isle of Wight) (some beers brewed at Goddards) - Islander 4.00 I was offered a taster of this - which seemed fine for flavour - rather a flat pint when poured though. Got off the train with Gareth and came straight here. There were a handful in and we sat at the back. Goacher's - Crown Imperial Stout 4.50 We got the last 2 pints. Lovely stuff, as Alan Partridge would have said if he were here. 4th pub of the night. Sat in the front and had a chat with Gavin from the Copper Pottle who was on a night out. Evening. As oft said before I wish this pub would blackboard up Brewery, Beer Brand Name, abv. It almost always fails to show brewery. My colleague thought he was getting a King of Horsham beer when he ordered Kings Citra but it was Mighty Oak Kings (which happens to be made with Citra hop). Very annoying. Evening. Do wish the beer blackboard would show full brewery name and beer brand name for each offering to avoid the need to squint through the cellar window to read cask labels. Lunchtime - here for the air show - pub is intermittently quite busy and then empty - as we all rush out to see the display. Kent - Session Pale 3.70 Delicious. Rockin Robin - Robin Redbest 4.00 Clean malty taste. Ian and I sat in the backroom. Nice pub with a few in the front bar. 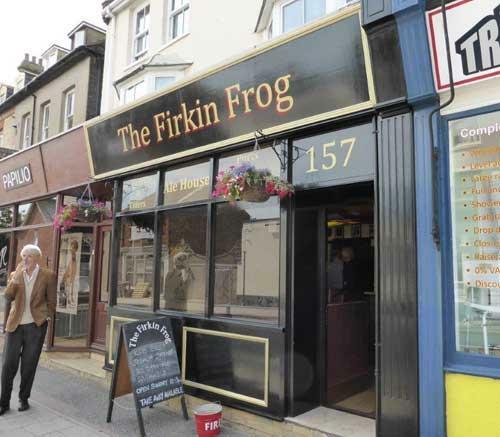 The pub is found in Herne Bay, Kent, CT6 5QA. Another East Kent Micropub, which opened on St George's Day Tuesday 23rd April 2013. Located at the town end of Station Road opposite the Four Fathoms. A shop conversion which was previously a Kitchen and Bedrooms Showroom. Selling real ales, ciders and wines with the beers and ciders originally on gravity stillage, in a temperature controlled cold room, which could be viewed through a glass window. Initially there was a full bar counter with hatch by the door to the gravity stillage. Low tables and chairs in the bay window. A separate quiet room with tables and chairs down the corridor and a unisex toilet at the back. Hop bines surround the front bay window and the ceiling is adorned with patriotic flags for counties, military and England. With new ownership came changes and now the bar counter is located where the cold room was and ales are served from handpumps. We have visited this pub 26 times, seen 62 different beers and tried 33 of them.